Helmet Heat is designed to keep your home safe from ice build-up, which could cause expensive damage. Used properly, it will reduce ice dams and icicles from forming along the edge of your roofline. 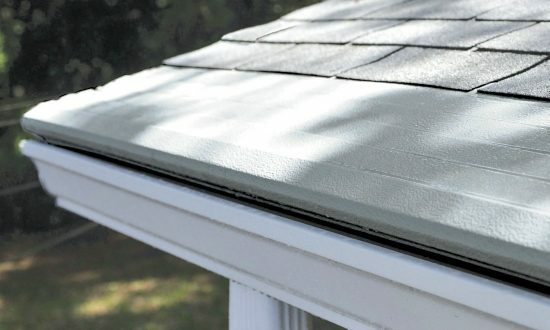 It will also keep your gutter system free-flowing, preventing further water damage during the winter months. Operating the Helmet Heat Ice Reduction System by Gutter Helmet® is simple. Since the heating cable is self-regulating, your main job will be to simply turn the system on and off at the right time. Or, you can elect to get the Helmet Heat System that automatically turns on at a certain temperature. The following steps will ensure that your system will work properly and efficiently. Helmet Heat is turned on either via dedicated heat cable breaker(s) or with a dedicated light switch. The Helmet Heat Ice Reduction System can likewise be turned off using your dedicated heat cable breaker(s) or switch. The system should be left on as long as there is snow on the roof of your home. The sooner you turn it on, the sooner it starts working. Please note that Helmet Heat is self-regulating and is designed to be left on for long periods of time. Once your roof is clear, it may be turned off until the next snow event is announced. Call (800) 824-3772 to talk to your local Gutter Helmet dealer today or complete our online contact form to schedule a free in-home estimate. With Helmet Heat and Gutter Helmet, you can say goodbye to all your gutter worries for good!